Editor’s Note: Please refer to previous posts on Hotsuma Tsutae, especially the initial post, https://okunomichi.wordpress.com/2013/05/17/hotsuma-tsutae/. Briefly, the Hotsuma Tsutae’s first 28 aya were written for Jimmu Tenno (r. 660-585 BCE) by Kushimikatama. 12 additional aya were written under Keiko Tenno (r. 71-130 CE) by Ohtataneko. The 40 aya were copied and annotated with kanbun by Waniko Yasutoshi in 1775. The Hotsuma Tsutae was discovered in recent times by Matsumoto Yoshinosuke in 1966. Suda Masako who is now 87 has been searching for Truth for forty years, as her mother Ryo did. Ryo’s father was a surgeon who died when she was 17. Ryo wanted to learn the right perspective for life which was precious. Her mother died around the time she graduated from college. Showa 44, 1969, mother and daughter began to study the Hotsuma Tsutae under Matsumoto Yoshinosuke, twice a month for a year and a half. Masako did suigyo water purification every morning and started to see spiritual things. Showa 58, 1983, they studied Ago’s Hotsuma Tsutae exclusively. Masako translated and wrote the stories in her own words, from Prologue to the last of the 40 ayas. Ago was living in Shimane. He sent Ogasawara Nagahiyo (great grandson of Michimasa) to see her in Yokohama. Ogasawara and five associates visited and asked if they could have her translation, and they would send her related materials such as their commentaries. She could see that her translation was more modern than theirs. Next, they examined the Hotsuma Tsutae (HT) of Ohtataneko’s kept at Hiyoshi Taisha in Biwako. This was the copy written out in kanbun, Chinese writing, by Waniko Yasutoshi in 1775, comprised of 24 books in three boxes. It was beautiful, interesting, and held deep meaning for Masako. This is the copy she used for her translation. Hotsuma Tsutae contains the origin of Japanese culture and the heart of Nihon. This is Suda’s fervent belief. 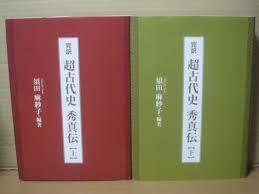 This set of two volumes by Suda Masako contains the complete Hotsuma Tsutae in these five forms: genbun original, yomikudashi straight translation, modern translation, Waniko’s kanbun, and Masako’s translation. Suda writes the kanji for Mikasafumi as book of kami riding on the mountain (as compared to others who write it as three umbrellas). Mikasafumi was written by Lord Kasuga, Ame no Koyane, who presented it to the 12th tenno, Keiko . It was edited by Ohokashima. This was at the time that Ohtataneko completed the Hotsuma Tsutae and offered it to the tenno. When heaven and earth began, the two parent kami had an Ame-no-sakahoko (representing order) and To-no-woshite (representing heavenly law), and all was good. As the number of people grew, they became more insensitive. Amaterasu made yatakagami to show truth, and gave the Mikusa-no-kantakara three treasures to Ninikine. Long after the human tenno age began, there was the ninth tenno Kaika (r. 157-98 BCE) who abused his power. He took his father’s concubine. Ohomikenushi, the grandfather of Ohotataneko, left his post at the government in protest. He was the fifth generation grandson of Kushimikatama who wrote the original 28 ayas of the HT. The new tenno, Keiko, needed help in governing the people and Ohotataneko provided it. He edited 40 ayas of the HT, the original 28 and the additional 12 ayas which he wrote. He presented them to the tenno. He was 234 years old. Hotsuma means perfect harmony. Hotsuma is also a way of life, a policy, so that when using Hotsuma, the country is Hotsuma. “If you count all the sands on the beach, you can never end the teaching of Hotsuma. Hotsuma is Oshiye no Michi.” Hotsuma is the teaching of the Way. This uta was written by Ohokashima no Mikoto, 247 years old, to congratulate Ohotataneko on the completion of the Hotsuma Tsutae. Amaterasu said that Ninikine is the reincarnation of Kunitokotachi because he separated lightning into fire and water, and he was given the name Wakeikazuchi. Ninikine was the first to be called Amakimi (Tenno). Amaterasu, after 170 ten thousands of years (1,700,000 years) went back to the sun and he is still shining on us. The 26th aya is about Toyotama and it raises a question of her being a dragon. It is due to the use, or misuse, of tenioha. Tenioha is an important element of grammar as it includes particles and syntactical relationships. Without proper application of tenioha, interpretations may be erroneous. Then, Ohokashima wrote the Hana no soe ueta, about Yamata no kuni and Hishiyo-no-miya, Keiko Tenno’s palace. Ohokashima was daiguji (kan-ochi) of Ise Kotai Jingu. Mikasafumi had 64 aya, and the copy or copies had many bug holes. Therefore, when Nihon Shoki was being written, using Mikasafumi as a reference, there would have been mistakes. Furthermore, when Toneri Shinao was diligently writing the text, Amaterasu was male. But the Empress had a doukyo Buddhist priest that she was in love with. He wanted to take over the country with his son. With his power over the empress, he was able to change the Nihon Shoki and make Amaterasu female. This entry was posted in Ancient civilization, Hotsuma, Hotsuma Tsutae and tagged Hotsuma Tsutae, Suda Masako on 2015/05/07 by Okunomichi.